Calling all eBook lovers, I have to share this with you! I happened to be browsing various social media outlets, reading linked articles and so on the other day when I happened across a link for BookBub. 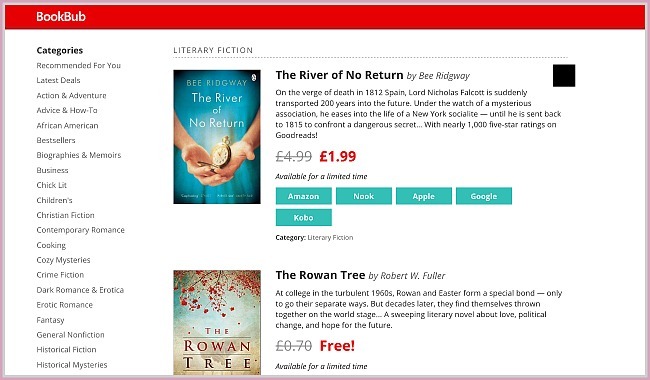 Basically, BookBub is a site which showcases books that are free or heavily discounted based on the genres you select when registering. It’s pretty awesome, as most sites simply list every book that is free or cheap, rather than only showing you those from genres you are interested in. Ditto with Amazon’s daily Kindle deal email: 90% of the titles just weren’t of interest to me. Better still, BookBub is free to join and use, and I’ve already downloaded at least a dozen books, none of which cost me more than £1 (most were free, yay!). It links mainly to the Amazon Kindle store, but some titles have links to other eBook vendors such as Apple and Google. It’s a treasure trove for those of us with a Kindle who don’t have an unlimited budget to spend on books. It’s also a great way to explore other genres or authors that you wouldn’t normally buy – as a lot of the books don’t cost a penny, you haven’t lost out if you don’t like them, but even better if you find a book you love! You can also choose to have an email with your recommended titles sent to you daily or weekly, or never if you just prefer to browse the site when you are looking for something new to read. I’d thoroughly recommend taking a look at BookBub if you’re an avid reader like myself… The only downside is my ‘to be read’ list keeps getting longer and longer! I also would like to note that I have not been compensated in any way to write this post, I just really love books! Have any of you used BookBub before? Do you have any other tips or recommendations for finding cheap eBooks?